Bed and Breakfasts near Windsor Racecourse for 1 night from Thu Apr 25, 2019 to Fri Apr 26, 2019 within 25 miles, in an Average Nightly price range of £1 to £200. The Royal Borough of Windsor has a rich mix of history culture heritage and fun which makes it one of South East England s loveliest short break destinations and a must see for everyone s list. br / br / br / br / Vale lodge is a great place to stay in Windsor. It s conveniently located so that it s within easy reach of many major tourist attractions and things to do in and around Windsor. br / br / br / br / It is a 5 minute car ride into Windsor town centre and also a 5 minute car ride to Bray village where you will find many Michelin star restaurants Waterside Inn 3 Michelin stars Fat Duck 3 Michelin stars Royal Oak Hinds Head and Crown all 1 Michelin star. Due to it s fantastic location Vale Lodge is a short drive away from many neighbouring towns such as Ascot Maidenhead Egham and Virginia Water. Here you can also find many activities such as golf horse races horse riding boat tours along the beautiful river Thames. Vale lodge is tucked away in a quiet residential location just one street away from Windsor racecourse. If you prefer to walk the property is a 25 minutes walk to Windsor town centre. There you will find Windsor castle the largest and oldest inhabited castle in the world and the Queen s favourite weekend home. Dorney Lake is 2.5 km from the hotel and Legoland Windsor is 2.1 km away. The Bed and Breakfast offers 5 rooms. They are fitted with free wireless internet and a mini refrigerator. An iron with ironing board can be provided on request. Some of the rooms have a view over the garden. Guests can make use of a shower a hairdryer and complimentary toiletries. Serving a selection of food The Windsor Lad Harvester and GOGO s Cafe are placed a 5-minute walk away. London Heathrow airport can be reached by car within 20 minutes. There is a car park on site with free self-parking available with prior reservation. Vale Lodge provides a quiet and relaxing stay in a location where the guests can return and unwind after a day full of activities in the Royal Borough. Dating back to the early 16th century, The Christopher Hotel Bar and Grill is located on Windsor's historic Eton High Street and offers contemporary accommodation with free Internet access and on-site private parking free of charge. The hotel boasts an Ã -la-carte restaurant and a bar, as well as a 24-hour front desk and a terrace. Rooms at The Christopher Hotel comprise a seating area and a private bathroom fitted with a bathtub, a shower and a hairdryer. Free toiletries are provided in all rooms, which also come with a seating area, a writing desk and tea and coffee making facilities. Guests can enjoy a variety of British specialities for lunch and dinner on the hotel's restaurant. Christopher's Bar and Grill is open all day every day for informal dining and drinks. London's city centre lies 40 km from the accommodation and London Heathrow Airport is a 15-minute drive away. Located in central Windsor, this exquisite Bed and Breakfast is the pick of the Windsor B&B's. 4 Star rated, all rooms have ensuite/private facilities. Free Wi-Fi Internet. Close to Legoland, ideal for families, vacation or business. Superbly located Windsor bed and breakfast for Legoland, sightseeing or business. Free unlimited wireless broadband. All ensuite rooms with self-catering facilities. Family friendly. 5 mins walk to town and shops, restaurants. No Pets and Non smoking. This 17th-century house is between the banks of the River Thames and Windsor Castle. It is now a 4-star hotel and has free Wi-Fi, air-conditioned rooms, an award-winning restaurant and a spa. All rooms are individually decorated in a modern style. All rooms feature a TV, a luxury private bathroom and a spacious work area, whilst some overlook the River Thames and Eton Bridge. Most room are located in the main house; there are also 4 historical annexes offering more private and secluded rooms. The spa at Sir Christopher Wren Hotel has a sauna, an outdoor spa bath and a large 3-level gym with yoga and a relaxation room. Set by the river, The Brasserie at Sir Christopher Wren has been awarded for its modern European cuisine, made using seasonal produce. Full English and continental breakfast items are served every morning. With many bars and restaurants in the immediate area, the nearest rail station is 2 minute's walk away. Historic Windsor Castle is 0.3 miles away, and the Theatre Royal is on the hotel doorstep. Situated in the historic town of Windsor, Holiday Inn Express Windsor is just a 10-minute walk to Windsor Castle and the town centre. Business guests can make use of the conference rooms, and parking is also available at this property for an additional cost. Free Wi-Fi is featured in each air-conditioned room at The Holiday Inn Windsor, as well as a flat-screen LCD TV and an en suite bathroom. A buffet breakfast is served daily, and guests can also enjoy a drink in the bar and lounge area before exploring the town centre. London Paddington can be reached in just 30 minutes via a train from Windsor & Eton Central station, which is a 15-minute walk from the hotel. Legoland theme park provides a wide variety of family entertainment and can be reached in a 10-minute drive. Parking on site is available at a GBP 13 per night extra fee. Situated on Windsor High Street, just opposite the famous Windsor Castle, Macdonald Windsor offers bedrooms with free WiFi access throughout the property. The hotel also features a restaurant and bar. The individually styled rooms at Macdonald Windsor have air conditioning and modern bathrooms with free toiletries. Rooms also feature flat-screen TVs with satellite channels and iPod docks. Caleys Restaurant offers intimate dining, and serves a creative menu using organic and seasonal produce. Cooked breakfasts are served daily, and 24-hour room service is also available. Just a 15-minute drive from London Heathrow Airport, Macdonald Windsor Hotel is a 20-minute drive from Thorpe Park. In the heart of Royal Windsor, it is just 1 mile from Windsor Racecourse and 4 miles from the Eton Dorney Rowing Lake. Valet parking is available at a surcharge and needs to be pre-booked. The hotel also features a Green Car charging point. The Macdonald Windsor Hotel is set in the heart of Royal Windsor situated two minutes walk from the gates of Windsor Castle and 1 mile from Windsor Racecourse. Just a 15-minute drive from London Heathrow Airport minutes from M4 and M25 and less than 40 minutes from London Paddington perfect for business or leisure alike. The 120 luxury bedrooms in a mulberry and metallic colour scheme are well appointed with plasma TV s air conditioning Bose IPOD docking stations and free Wi-Fi. Caleys Restaurant offers intimate dining and serves a creative menu using organic and seasonal produce. Cooked breakfasts are served daily and 24-hour room service is also available. Macdonald Windsor Hotel has now installed a Green car charger in the car park for residents and guests to use. On site car parking is subject to availability and must be pre-booked in advance. The Royal Borough is home to some of the most well known attractions and the Macdonald Windsor Hotel is the perfect base to experience them. Visit Legoland or Thorpe Park enjoy a day at the races relax in Savill Gardens situated within Windsor Great Park or soak up the heritage of Eton College with its historic buildings. Or indulge in a relaxing boat trip or romantic horse drawn carriage through the Park. Windsor Guest House is ideally situated for the perfect Windsor experience. Visit us for a weekend shopping trip a Legoland adventure business excursion or even just a relaxing break we are conveniently located for all that Windsor has to offer; such as Windsor Castle and are just 200 yards away from the beautiful Windsor Great Park. To and around Windsor there are excellent reliable rail links to London and a 15 min drive to Heathrow Airport. Full English Breakfast is included in the rate. Originally built for Queen Adelaide in the mid 1830s, The Royal Adelaide Hotel is an elegant Georgian building with an original exterior and large sash windows. Windsor Castle is 0.5 miles away and Legoland Windsor is located 2 miles away. Free WiFi is available throughout the property and parking is available on site. All the 42 air-conditioned, non-smoking rooms have a modern bathroom, comfortable bed, flat-screen TV and a writing desk. A stylish lounge and bar are on offer, as well as a brasserie serving freshly prepared cuisine using fine seasonal produce, and 2-course dinner menus. Room service is also offered. The hotel has a great location opposite The Long Walk towards Windsor Castle and just a few minutes' walk from the shops, restaurants and galleries of Windsor and Eton. Holiday Inn Slough Windsor has recently undergone a Â£1 million refurbishment and is located just 10 minutes' drive from Heathrow Airport. The modern hotel has a mini-gym, a stylish brasserie restaurant and spacious rooms with internet access. The bright and airy bedrooms each have a work desk and a TV with on-demand movies. Some rooms have views of Windsor Castle, and all feature air conditioning and tea/coffee facilities. The Courtyard Brasserie Restaurant serves buffet breakfasts and an international menu for evening dining. Guests can enjoy beverages and light snacks in the bar, and 24-hour room service is available. The Copthorne Hotel Slough is less than 10 minutes' drive from historic Windsor. It has extensive leisure facilities, including an indoor heated swimming pool and a gym. Parking is available at an extra fee. All of the modern, airy rooms include free use of the hotel's leisure facilities, and have a TV with satellite channels. Guests can enjoy the on-site sauna, whirlpool, and steam room. The leisure club also features additional spa and beauty treatments. The Bugis Street restaurant serves authentic Singaporean, Malay, and Chinese cuisine. Guests can also enjoy a drink in the Copthorne Hotel Slough Windsor's relaxed bar area, or further bistro dining in the Retrouve CafÃ©. Heathrow Airport is 15 minutes' drive away, while Slough Rail Station is less than a 10-minute drive away. The M4 motorway is just 5 minutes from the hotel. The perfect stopover for those departing on holiday the Slough hotel is just 9 miles from Heathrow Airport and home to Slough Trading Estate the largest trading estate in Europe making this a perfect choice for business travellers. Ideal for those seeking accommodation in Royal Berkshire guests can visit Windsor Castle (3.5 miles) to catch a glimpse of the official residence of the Queen. For nature fans Windsor Great Park and Dorney Rowing Lake a world-class canoeing centre and host to some of the 2012 Olympic Games are also nearby while families can enjoy the interactive rides at Legoland Windsor (5 miles). If you want to try your luck at the races Ascot Racecourse is only 8 miles away and Windsor Royal Racecourse is slightly closer to home. Whether you re travelling for business or leisure or merely seeking a convenient stopover location you ll find everything you need at the Slough hotel. This hotel has our fresh new look and upgraded rooms. Every room has a comfy new king size bed complete with a cosy duvet and four plump pillows. Useful information Due to the city centre location some external noise may be heard. Due to building works/roadworks taking place near to the hotel some external noise may be heard during the day. Early/Late Check-In/Out Service if you re looking to make the most of your day we can offer an Early Check-In service from 12:00noon and a Late Check-Out Service until 2pm so you have more time to relax - cost is �10 per service per room subject to availability - bookable direct by telephoning the hotel. We are a pet friendly hotel and allow up to 2 domestic pets per stay. This is at an additional charge of �20 per pet per stay. Please contact LateRooms to arrange this to be added to your booking and for further details on charges and terms and conditions. Please note that Guide dogs Hearing dogs and other animals to aid disability are exempt from charge. Amazing Slough Centre Apartment is situated in Slough, a few steps from Slough Borough Council, 80 metres from Slough Library, as well as 300 metres from East Berkshire Magistrates' Court. Free WiFi is featured. The apartment is fitted with 1 bedroom and a fully fitted kitchen with an oven and a microwave. The apartment also provides a seating area, washing machine and 1 bathroom with a bath. Slough County Court is 300 metres from the apartment. London Heathrow Airport is 14 km away. Overlooking the village green, The Manor Hotel offers good food and spacious rooms. The Manor is by Datchet Rail Station, and less than a 5-minute drive from Windsor Castle. The Manor Hotel's individually designed rooms feature multi-channel TV, power showers and tea and coffee facilities. There is free Wi-Fi in the public areas. With original fireplaces and timber floors, the brasserie restaurant and bar offers a varied menu featuring local produce. The cosy library has leather sofas, and there is a small fitness room. Set in a tranquil area of Windsor, Heathrow Airport and Legoland Windsor are just 5 miles from Manor Hotel. Set in four acres of landscaped grounds in Slough, Baylis House Hotel is located in a Grade I-listed building. This 4-star accommodation features antique decor with contemporary facilities. The 40 individually designed en-suite bedrooms come with LED TV, climate control and tea and coffee-making facilities. The Baylis House Hotel features banquet and business meeting event spaces. On-site parking is available. The property is only 35 minutes by train from the centre of London and 7 miles from Heathrow Airport. Windsor, where guests can visit Windsor Castle and Legoland, is 3 miles away. We are well located close to the town centre and 5 minutes from the Slough Trading Estate with ample free parking monitored by CCTV. br / br / br / br / Most rooms have recently been totally refurbished and have central heating power showers TV tea/coffee facilities. br / br / We are 10 minutes from Heathrow Airport 5 minutes from Historic Windsor / Ascot 25 minutes from Central London and less then 10 minutes from Picturesque Burnham Beeches. 10 minutes from 3 major motorways. It s also conveniently located for visiting Windsor (though offering much better value than Windsor hotels).Breakfast and evening meals are available at an extra cost. br / br / br / br / Take time out to visit the Queen s weekend retreat 3 miles from the hotel at majestic Windsor Castle. Kids will love the miniature cities and exhilarating water rides at Legoland theme park 4 miles away as well as exploring Kew Gardens. For a day out for adults you can have a flutter at Windsor Racecourse. Furnival Lodge is situated in Slough. The accommodation is located 1.7 miles from Burnham train station, and 2.1 miles from the M4 motorway. It offers free parking and WiFi. The bed and breakfast has a shared garden and lounge area that guests can enjoy. Each room is en suite and features a TV and tea and coffee making facilities. A full English or Continental breakfast is available. Meeting and banquet facilities are available. Legoland Windsor Resort is a 22-minute drive from the property. Furnival Lodge is 5 miles from Windsor Castle, and Savill Garden is 9.3 miles away. Heathrow Airport can be reached in 25 minutes. Choose Furnival Lodge Slough's premier guest accommodation. Situated in an ideal location close to Windsor and Maidenhead and offering spacious guest accommodation. Furnival Lodge was established in 1988 and recently refurbished. We are proud to say we set the standard in guest accommodation offering a choice of elegant and spacious ensuite guest rooms. br / br / br / br / We offer a guest lounge access to email and fax facilities and free off-street parking. br / br / br / br / Windsor town centre is about 5 miles away where Windsor castle boat trips or a great day out can be enjoyed. Legoland is a popular destination for families and is located about 7 miles away. There are several golf courses within a mile or two. br / br / br / br / Furnival Lodge is ideally located near the M4 (1.7 miles away) M40 (4.9 miles away) and M25. Within easy reach of central Slough Windsor and Maidenhead. Slough train station is 2.5 miles away with regular trains to London Paddington and Windsor. br / br / br / br / If you re after a warm welcome (RAC warm welcome award) and a pleasant stay Furnival Lodge is the ideal place. With free parking and free Wi-Fi, Skyways Hotel has a restaurant and spacious rooms with en suite facilities. Just 10 minutes from Heathrow Airport, central London is 20 minutes away. The large, airy rooms at The Skyways offer tea and coffee facilities and a seating area. All rooms also have satellite TV, a hairdryer and ironing facilities, and there is ample work space. The Skyways Hotel Slough has an on-site bar and restaurant, offering traditional cooked breakfasts each morning. An Italian menu is available for evening dining, and the bar offers a wide range of beverages. Just a mile from Slough centre, Skyways is a family-run hotel situated just minutes from the A4 and M4 motorways. Historical Windsor Castle is a 10-minute drive away, and Slough Station can be reached in 5 minutes. With a restaurant, pizzeria and bar, and a health club, the Heathrow/Windsor Marriott Hotel is situated 0.3 miles from the M4 and 4 miles from Heathrow Airport. Leisure facilities include an indoor pool, a sauna and a state-of-the-art gym. Fitness classes in yoga, pilates and spinning are also available. Modern, elegant rooms all feature air conditioning, a 49-inch Smart TV, a seating area and tea and coffee. Each room also has a private bathroom, whilst some enjoy executive lounge access. At the Marriott guests can dine in the Brew Bar Lounge, or the Market Kitchen, where traditional International cuisine including made-to-order pizzas are served. Guests can enjoy free WiFi access in all public areas. There is a local bus that will take guests to Terminal 5 of Heathrow Airport. Slough Train Station is a 10-minute drive away, providing links to London in 20 minutes. Offering elegance, peace and tranquility, this lovely Georgian hotel is set in 10-acres of landscaped gardens; the ideal destination for a relaxing break, within easy reach of Royal Windsor, Eton and Henley. The gardens provide an ideal setting for those looking for a quiet place to stroll, or if you are feeling more energetic there's also a well-equipped pool and leisure club. After a day of discovering the countryside or simply relaxing, the twice AA Rosette-awarded restaurant is the perfect place to enjoy fine cuisine. Built in 1727, this 4-star hotel is located only minutes away from the M4/M40 and Burnham railway station, which has a direct line to central London, meaning that it is a popular destination for both business and leisure visitors. River Arts Club is located in Maidenhead, within a 10-minute walk of Maidenhead Magistrates Court and 1 km of Maidenhead Library. This bed and breakfast offers a garden. Free WiFi is available throughout the property. Guest rooms in the bed and breakfast are equipped with a flat-screen TV with satellite channels. Every room is fitted with a private bathroom with free toiletries, while certain rooms are equipped with a terrace and others also boast river views. Guests at River Arts Club can enjoy a continental breakfast. The accommodation offers a terrace. A variety of popular activities are available in the area around River Arts Club, including cycling and hiking. The Fat Duck is 1.6 km from the bed and breakfast. 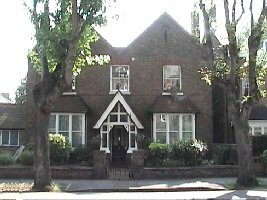 The nearest airport is London Heathrow Airport, 18 km from River Arts Club. Located on the scenic banks of the Thames, this hotel is ideal for Windsor, Legoland, Ascot Racecourse and London. Many of the rooms, excluding the single rooms, have small balconies and offer river views. The hotel is a 30-minute train journey from London Paddington and a 20-minute drive from Heathrow. The relaxed, friendly Blue River Bar and Restaurant has a riverside terrace and garden. There are sofas, armchairs, an open fire in the bar area and a large spacious eating area. All rooms offer comfortable beds, a flat-screen TV with Freeview and free WiFi.